A rainbow birthday cake is fun to look at and fun to eat, but a lot of people tend to shy away from it because it looks like a lot of work. Well, I’m here to tell you that it’s not. You use the same ingredients as baking a regular cake, but just with a few more steps and a little extra time. To get you on the road to rainbow cake success, I’ve put together a complete step-by-step guide for how to make a rainbow birthday cake that will make it super easy for you. Start with a basic vanilla cake recipe or a box/packet cake mix. Make up the batter according the recipe or packet directions. Each quantity of batter will give enough for 2 x 9 inch cakes, so for a 6 layer rainbow cake you will need 3 quantities of the recipe or box mix. If you have slightly bigger (10 inch) or smaller (8 inch) cake pans already, just use those. It will still work fine. It is easiest to work with one batter quantity at a time and split it in two. While these two cakes are cooking you can make up the batter etc for the next one. Add coloring to the batter mix and whisk in well. 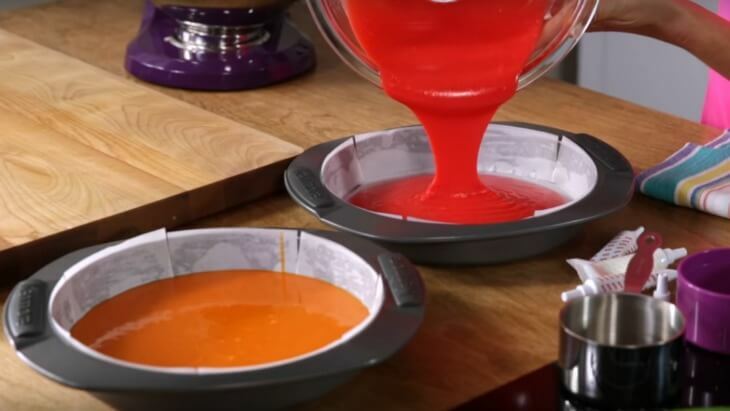 Use food gel coloring (rather than liquid) for best results – it will give bright, vibrant colors and not affect the batter consistency. You will need about half a tube per color. 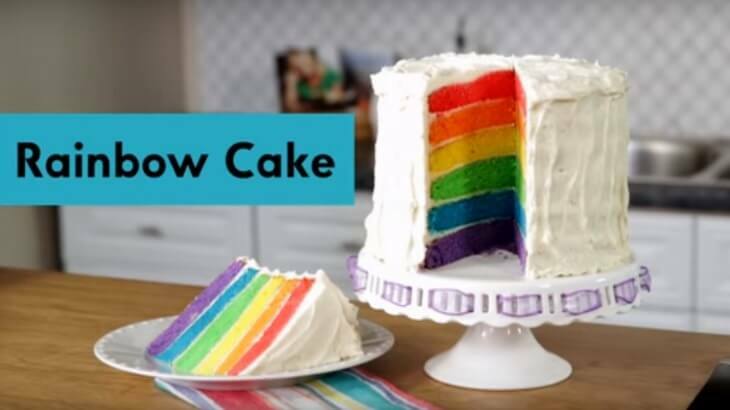 To create your rainbow cake you need to make a layer each of purple, blue, green, red, orange and yellow. 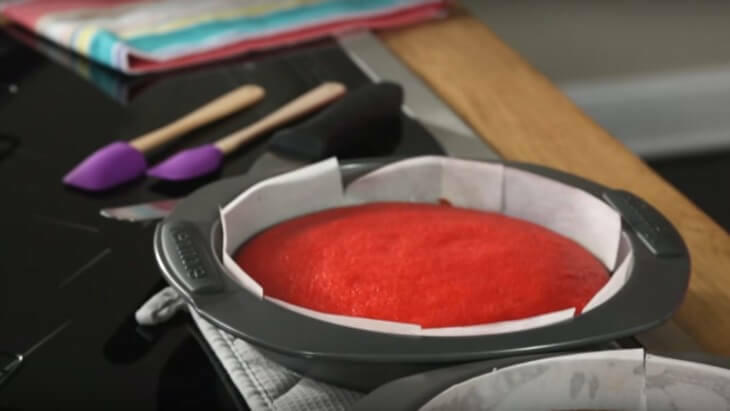 Pour the colored batter into cake pans that have been greased and lined with baking paper. Bake the cakes in a preheated 350 degree oven for about 35 minutes. Test to ensure they are cooked by inserting a skewer or testing stick into the center. Once it comes out clean, they are ready. Remove from oven to cool. Allow all the cakes to cool completely in the pan before removing. Now it’s time to level the cakes by taking the very top layer off with a serrated knife. If using a serrated knife, hold the top of the cake with your hand and let a lazy Susan do the work. If you don’t feel confident doing this, a cake slicer leveler is a better option (this is the way I do it – I can never seem to get it level otherwise). This will also ensure each cake layer is the same height and even on top. Make up a double batch of buttercream frosting ready to ice the cake. It’s time to assemble the cake and put the layers together. Start off with purple and place it on the lazy Susan (put a bit of icing on it first so the cake doesn’t slip around). Add a quarter to a half a cup of the buttercream frosting, and just give it a light layer – it’s like the glue for each layer. Keep adding the layers and icing in between. The order of colors is purple, blue, green, yellow, orange and red. Put a base layer of frosting over the entire cake. This is also known as the crumb coating. Now it’s time to frost it however you like! You can use extra butter cream that doesn’t have all the crumbs in it, or color some frosting and use that to decorate. Also, any sort of extra decoration can be added e.g. sprinkles, candy, edible decorations. Although creating a rainbow cake does take a little time, it really is easy. And what’s great about multi-layered cakes is that you don’t have to stick to the traditional rainbow. You can use whatever colors you want. Try different ideas for holiday parties, sporting events, you name it.